We went to the hospital today for our 20 week ultrasound. This is the one where they do the full anatomy screening, measuring all the parts and saying, "oh, that looks good..." They also could have told us whether it was a boy or girl, but we decided to hold out for the surprise, so we had to turn our heads when they got to that part. Following that, we went to the ob/gyn for kris' check-up....everything is looking good. Kris is up 7 pounds total, doctor thought that was good. Baby weighs 12 ounces and has a 148 bpm heartbeat. Another new stat is the doctor has our due date in all the paperwork as 12/25, not the 12/27 we thought after our dating ultrasound. I look at this as a good thing, seeing only 4% of babies are born on their due dates. Either way, we're going to have an awesome Christmas this year. We've posted an album on Picasa, including our 'clay baby' pictures (a.k.a. 3D sonogram). Click on the pic below to check them out. I currently spend about 90% of my time talking about my four kidz. this is so wonderful! In reference to 3D pic #2, he/she is clearly in deep thought! That is excellent! Smart kid! I love the 3D shots - its so crazy they can do that. Already proving to be a cutie! ...and in reference to the 3D shot #1, it looks like little Beanie is singing and pretending that his/her thumb is a microphone. He/She is soooo cute!!!! 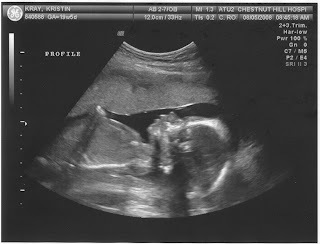 I can only hope the gender ambiguity doesn't confuse this poor child before it is even born. I think at this point we can eliminate the need for he/his/her/hers and just say "Baby." "Baby looks great in 3D." "Baby seems to have Nick's appetite." "Did you see the picture where it looks like Baby is signing the Magna Carta? Adorable."